It’s very important to understand addressing mode before understanding instruction sets. Here we provide several data addressing mode examples. For example “mov ax, 11b” will move immediate value : 11 binary to ax register, those 2 bit will be moved to al register. So basically it’s the same instruction as “mov al, 11b”. Another example when ah = 0h and al=0h : “mov ax, 100h”. Since 100h in binary is “100000000b” it will overflow 8 bit register al, hence the first bit : “1b” will be placed on ah register. Using direct addressing, we directly load an offset address of variable to a register. Using direct offset addressing, we directly put offset address of string hax to dx register. The rule is that if no segment register specified, default segment register that will be used is ds, and as any other transfer instruction operand’ maximal size is size of destination. “mov dx, ds:[10ah]” will move byte at address ds:10ah to register dx. The rule is register size must be the same. If source is 8 bit regsiter, destination must be also 8 bit register. You won’t put operand size larger than destination register. Using register indirect addressing to access data means we use a register as a pointer to a memory address contains specific bytes. For example once instruction “mov dx, [bx]” executed, what happens is microprocessor will check offset address that is in bx register, for example bx register contains : “10e”. Microprocessor will suppose it as an offset address, Microprocessor then will fetch 2 bytes on offset 10eh and move it to dx register. Actually instruction “mov dx, offset hax” is a junk, this is just for debugging purpose, just like printf(on user space c codes) and printk (on kernel space c codes). At first “mov bx, 10eh” this instruction will move 10eh. 10eh will be supposed as offset address of variable hax. microprocessor will get 2 bytes from 10eh and move it to dx register. This mode uses special purpose index register such as si and di. If no segment register specified, by default ds will be used. On routine : “mov bl, byte ptr cs:[si]” it will move byte that pointed by offset address which recorded in source index. What above codes did is simple, just print string “sayhawatpu” in vga video mode. This addressing to access data uses combination of base register (bx and bp) and index register (si and di) to acquire data in memory. a result of calculation of bp + si into bl register. This mode is combination of indexed, base and displacement data addressing mode. Displacement can be 8 bit or 16 bit depends on the size of destination and purpose of routine. This entry was posted in 8086, Addressing Modes, Microprocessor, x86 on September 11, 2014 by sw0rdm4n. Interrupt is a mechanism that allow hardware or software to suspend normal execution on microprocessor in order to switch to interrupt service routine for hardware / software. Interrupt can also described as asynchronous electrical signal that sent to a microprocessor in order to stop current execution and switch to the execution signaled (depends on priority). Whether an interrupt is prioritized or not depends on the interrupt flag register which controlled by priority / programmable interrupt controller (PIC). hardware interrupt, this is external interrupt caused by hardware; for example when pressing keyboard. Non-maskable interrupt (NMI), the interrupt that can not be ignored by microprocessor. 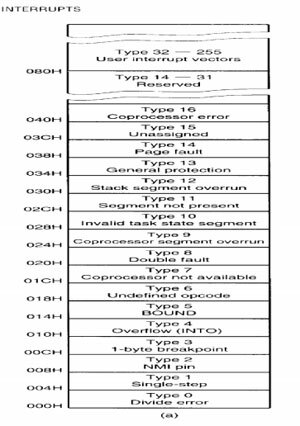 Interrupt vector table on 8086 is a vector that consists of 256 total interrupts placed at first 1 kb of memory from 0000h to 03ffh, where each vector consists of segment and offset as a lookup or jump table to memory address of bios interrupt service routine (f000h to ffffh) or dos interrupt service routine address, the call to interrupt service routine is similar to far procedure call. The size for each interrupt vector is 4 bytes (2 word in 16 bit), where 2 bytes (1 word) for segment and 2 bytes for offset of interrupt service routine address. 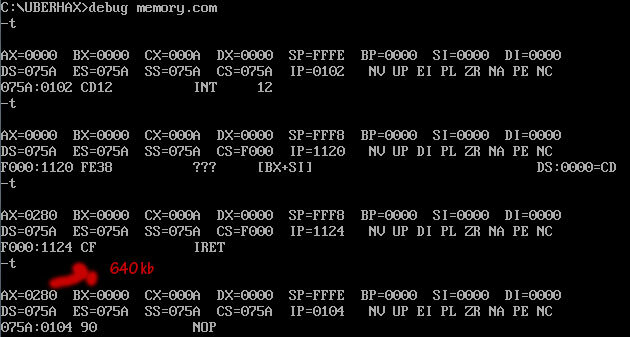 address to hardware or bios interrupt handler routine, meanwhile 20h-ffh (int num 32-255) consist of jump table address to dos interrupt handler routine. 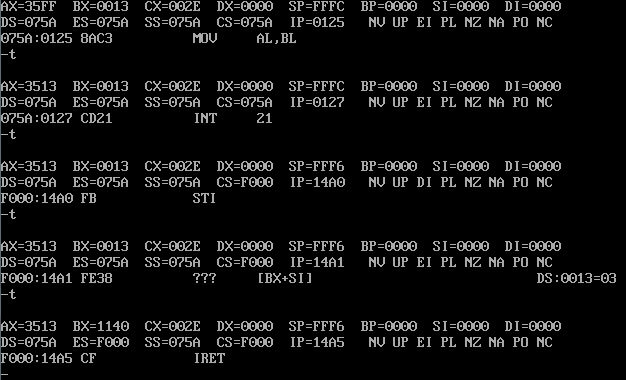 For example int 13h that located on ivt at 0000:004c contains address of Bios ROM Interrupt Service Routine, what it records is segment F000h, and offset 1140h, each bytes of that address will be placed little endian. The lower the interrupt number on interrupt vector table means the more priority needed for an interrupt. On boot, interrupt vector table initialized by bios on rom, then interrupt vector table loaded to RAM. Microprocessor get correponding entry on interrupt vector table by multiplying interrupt number with 4h. For example if int 16h called : 16 * 4 = 58h. Corresponding logical address that contains address of rom bios routine for int num 4h will be on 0000h:0058h. (example of commonly used pic on 8086 architecture is 8259a PIC). If interrupt flag on microprocessor sets to 0, processor will ignored the incoming interrupt signal. But if interrupt flag on microprocessor sets to 1, once interupt signal received by processor, microprocessor will stop current execution. Microprocessor then will saves flag registers, then push address of next execution counter (cs:ip) on the stack for later return. Microprocessor then will send ack to PIC, the PIC then send interrupt number to processor, This number then will be multiplied by 4 as offset address of the interrupt vector table. Microprocessor then will do a lookup to find a corresponding segment (cs) address and offset (ip) address of isr address from interrupt vector table, once found, processor will sets interrupt flag to 0 (disable interrupt) then both segment and offset address of interrupt service routine which taken from interrupt vector table will be put on cs:ip, where cs is the segment address of interrupt service routine (ISR) and ip (instruction pointer) will be offset address of interrupt service routine, then processor begins executing routines from interrupt service routine (similar to far call). After interrupt service routine / interrupt handler routine executed, processor will pop back cs and ip then pop back flag register on the stack, then micropocessor will return to address that previously saved on the stack which now on cs:ip. Another example of mechanism from the software point of view is when an assembly program execute int 13h function 1h (get recent disk status operation). The processor will record flag register and program counter for return address onto the stack, where this will be used for iret instruction in order to go back to next software routine after interrupt routine instruction completed. The next execution of processor will lookup corresponding entry for interrupt number 13h on interrupt vector table. As already mentioned before offset address on interrupt vector table is interrupt number multiplied with 4 : 13h * 4h = 4ch = 0000:004c (0000:004c on ivt contains logical address of interrupt 13h ISR address). Once the entry found, where it contains of 1 word segment (cs) and 1 word offset (ip) of bios rom routine address for interrupt 13h disk service it will be loaded to cs and ip. Based on the calculation cs will be and ip will be taken from rom bios address that recorder on interrupt vector table address at 0000:004c. Once an assembly program call int 13h , microprocessor will save flag register and program counter (address of current execution), microprocessor then do a lookup to find corresponding entry for “int 13h” on interrupt vector table. Once corresponding entry found, it will jump to corresponding int 13h bios label (far call), since we use function 1h the next instruction will jump to int13_last_status label. means there’s an error of recent disk operation. If ah = 0 then instruction clear carry flag before iret will be executed, but if error found, the next instruction will set carry flag before iret. Once iret executed the instruction will then be returned back to next routine of assembly program that calls int 13h. Another example is when int 21h function 2a being called, when microprocessor determine that the interrupt is prioritize rather than current execution, microprocessor will save flag register, program counter onto stack. Once more, microprocessor will have a lookup on interrupt vector table. As previous, logical address of int 21h on interrupt vector table can be found on interrupt vector table offset 0084h. We got IVT offset by multiplying interrupt number with 4. For interrupt 21h, the calculation to get interrupt vector address is : “21h * 4h = 84h = 0000h:0084h”. So entry for int 21h ISR address from interrupt vector table is located at logical address 0000:00084h. After interrupt execution completed (right after iret), the processor will back to next instruction which recorded on stack before by pop it back to cs and ip (previously, the next instruction is suspended when microprocessor receives irq from pic). Below is some examples of bios interrupt and it’s usage. We do not provide complete list here, since the purpose just for understanding bios interrupt usage. int 10h handling routine was provided by bios, this interrupt is used for video mode operations. Example : int 10h function 00h. This is for setting video mode. int 12h used to get memory size. This interrupt will returns the contents of the word at segment 0040h and offset 0013h into ax register. We can see it contains bytes in little endian order : 80 02, in non little endian = 0280h , in decimal = 640. So we got 640kb memory size. int 21h is dos function codes, provided by dos operating system. example : “int 21h function 35h“, this interrupt function is used to get address of interrupt service routine where it’s recorded at interrupt vector table. After int 21h function 35h executed, es (extra segment 16 bit) register will be segment address of ISR and bx (base register 16 bit) register will be offset address of ISR. We can see that bx contains offset of address of int 13h routine provided from rom bios (on RAM) : 1140h. Meanwhile es contains segment address of bios routine that serve int 13h : f000h. So bios routine that provides ISR for interrupt 13h starts from address f000h:1140h. On interrupt vector table int 13h can be lookup on 0000:004c (13h * 4h = 4ch). To dump memory content at 0000:004c we type: “d 0000:004c l 4” means we wish to dump 4 bytes from memory at segment 0000h offset 004ch. We can see on 0000:004c contains 1 word for segment and 1 word for offset address of interrupt service routine for int 13h, which encoded using little endian order : 1 word (2 bytes) for offset : 40 11 and 1 word (2 bytes) for segment : 00 f0. Where if encoded to non little endian offset = 1140h and if segment encoded to non little endian = f000h. We’ve cross checked that isr address of 13h handle routine mapped at address f000:1140. This interrupt used to get system date, once iret of isr executed, cx will contains year, dh contains month,dl contains day. This routine mostly abused for time bomb virus in past time. This entry was posted in 8086, Interrupt, Interrupt Vector Table, Microprocessor, x86 on September 9, 2014 by sw0rdm4n. Back again to old days, x86 architecture was introduced by intel around 1978 when they released 8086 microprocessor. 8086 introduces real mode where memory consist of segments and offsets (segmented memory). 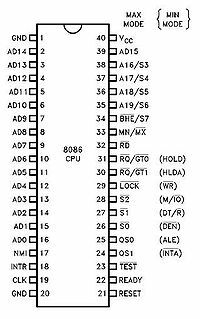 In 1982, intel released 80286 that introduced protected mode but not used widely yet until the release of 80386. Protected virtual address mode was widely used since i386 (80386 processor) where it introduced paging and virtual address, replacing the old real mode addressing ( but on boot i386 processor still uses real mode). Meanwhile i386 still had real mode environment via virtual 8086 mode. Nowaday modern operating system commonly uses protected mode on run time, however on boot before switched to protected mode, intel cpu still runs on real mode. The switch phase from real mode to proctected mode accomplished by real mode kernel. Why 8086 ? because 8086 design is the basic of all intel x86 family until x86_64 processor, however intel x86_64 or amd64 cpu still runs on modified real mode on boot before real mode kernel switched to protected mode kernel. 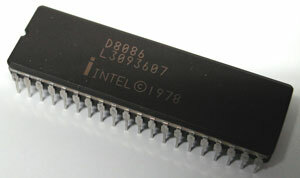 Intel 8086 was 16 bit cpu with 20 bit addressing. Based on it’s design , it was only capable for 16 bit addressibility. Intel engineer designed memory segmentation (segment and offset pair) in order to have ability for 20 bits addressing. (2 ^ 20) * 1 byte = 1.048.576 bytes (1 mb). So we may conclude without segmentation and offset, intel 8086 cpu only has 64 kb addressing capability, but with the use of memory segmentation design, it has until 1 mb addressibility. On real mode, each segment size is 65536 bytes (each size is 64 kb where 1 kb is 1024 bytes, each segment is limited by 16 bits). Memory is arranged using segment and offset pair. this isn’t one to one mapping means 2 or more segment and offset may be translated to the same physical address. This entry was posted in 8086, Microprocessor, Real Mode, x86 on August 28, 2014 by sw0rdm4n.